The mister’s marvelous Mum gave me a very generous Spotlight voucher for my birthday in May, and I was looking forward to a quiet unplanned weekend when I could redeem it. Finally it came, a couple of weeks ago, and this top is one of the pieces that I made! 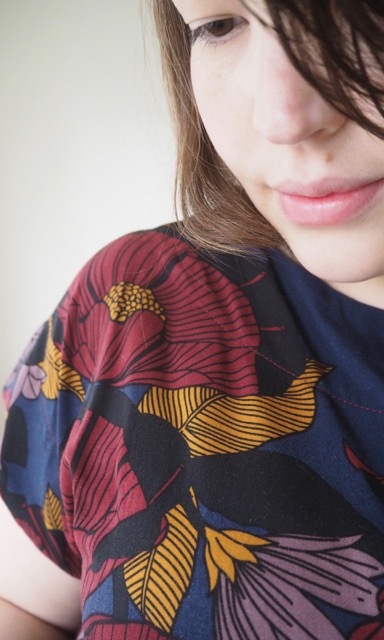 I snapped up this gorgeous poppy-print rayon the moment I saw it on the shelves – it’s got a lovely soft drape, and the bold print makes a statement in some of my favourite colours. 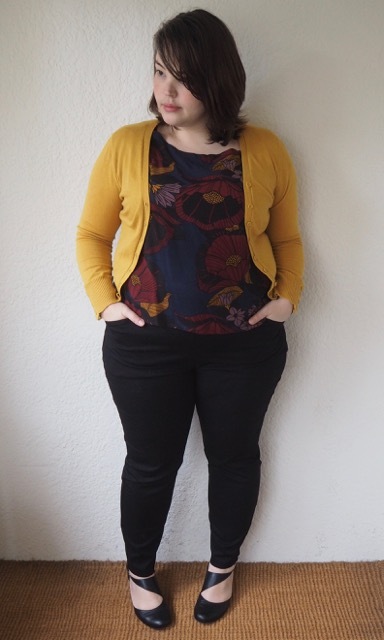 The mustard, deep red, black and navy mean that there aren’t many items in my wardrobe this top won’t match. 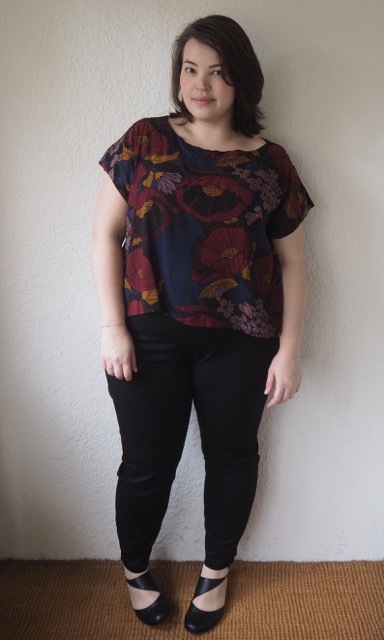 I took the opportunity to crack out my newest pattern, an easy little downloadable number that I’d bought from Marilla Walker after seeing Meg from the Curvy Sewing Collective rhapsodising about it. 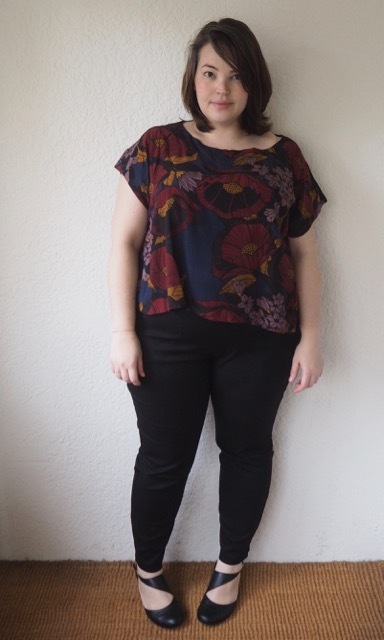 It’s a great basic top, and a really good project for beginner sewists – There’s no tricky darts, or sleeves to set in and while the neckline and sleeves are interfaced you could easily skip those and just hem them if you were a real newbie. The pattern sizing is spot on. 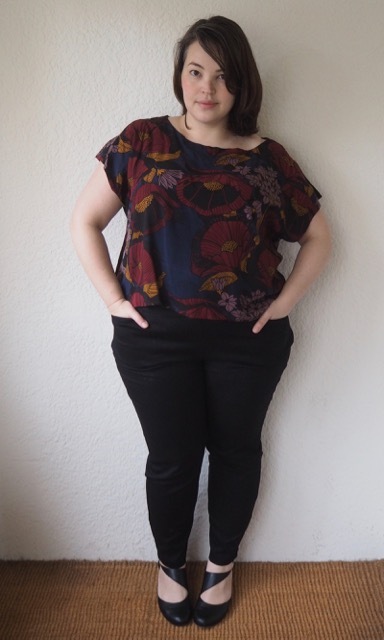 I recently made a second version of this top with a friend who’s quite a few sizes smaller than me, and just like the version I’d sewn for myself, the size the pattern recommended for her measurements fit perfectly. It looks great tucked in as well, but for a casual work day I wear it loose over slim-fit trousers. These are some not-so-cheapie ponte pull-on pants that I succumbed to at Taking Shape. I don’t know why it’s so bloody hard to find well-fitting slim-leg trousers for plus sizes – I’d been searching for weeks before I finally caved and bought these. The elasticised waist (WHYYYYYYY?) means I can’t really wear them with anything tucked into them, but they fit well and are really comfortable, so I’m making my peace with the fact that cost SO MUCH, and don’t even have a functioning fly. For warmth I went with a mustard cardigan. This entry was posted in DIY and tagged comfort view, cool, DIY, taking shape by lillipilli. Bookmark the permalink. Great little outfit! And a ‘new to me’ designer – thank-you for the introduction!! Love your Maya top!! Great fabric choice! I’m so happy you liked the pattern after all my gushing about it 😉 This reminds me that it’s been a while since I’ve made a Maya; I must rectify that! A GREAT top deserves a great pair of pants! You are so lucky to have found a pair of pants that fit you just the way you like. The hardest thing to do is to fit the crotch area of your pants. If yours fit properly, you are 95% there. You can copy the shape of your pant legs from the hip down and add the top of a well-fitted skirt to get a nicely fitting pair of pants. You can find instructions on how to put in a front zipper in any jeans pattern. If you like the look of jeans, use that nicely fitted skirt pattern as a template for arranging the jeans pattern pieces. The slope of the fabric over the hip/front/back area needs to be sleek, so use the skirt pattern as your guideline for great fit in that area. Remember to pinch out the darts when you redraw the upper hip area on your new pattern pieces. To top-stitch, make sure you use jean thread on the top, but use regular thread on the bottom to reduce bulk. When hemming, put the jean thread on the bottom and the regular thread on the top, so you can see what you are doing. Remember, no one will get down to the bottom to check out how perfect it is. Use a hammer to pound the areas where there is a lot of bulk before you sew – like the seams at the hems. Don’t forget to add the studs at the stress points – a few hammer blows will flatten everything down and make it easier to put in the rivets. If you don’t have a jeans pattern, use your jeans as a guideline on how to sew the flat felled seams so that no one knows that your masterpiece isn’t RTW. Make a muslin or, better still, a mock up in pretty fabric as a pair of shorts to wear around the house to test out your new pattern. You CAN do this! Just think it through, step by step. 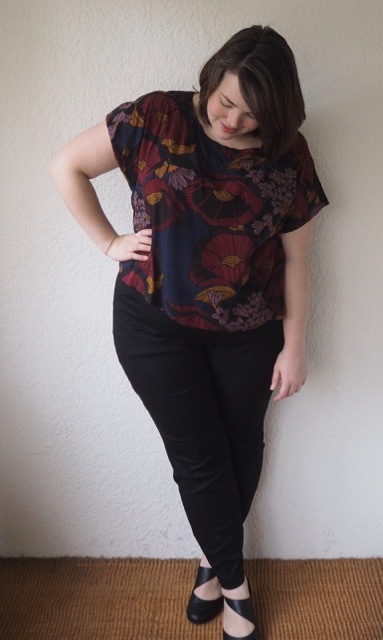 I love, love, love the top you made! The whole outfit looks beautiful on you!